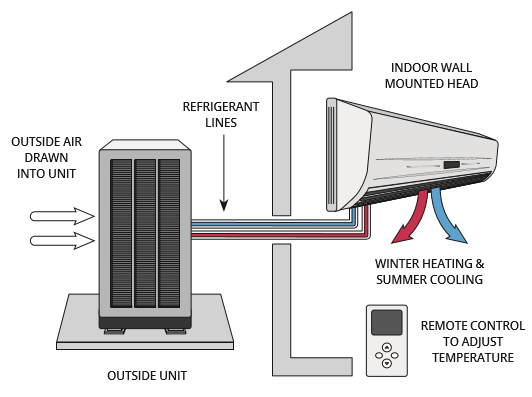 What are ductless/mini-split heat pumps? An ENERGY STAR® certified mini-split heat pump (also known in some cases as a ductless or mini-ducted heat pump) is the most energy-efficient and most climate friendly form of home heating and cooling currently available. A heat pump takes heat energy from one place and moves it to another by compressing and expanding refrigerant. A heat pump extracts heat from the air and transfers this heat to either the inside or outside of your home, depending on the season. An outdoor unit connects to a wall-mounted indoor unit by a small bundle of cables, including the refrigerant line. A remote control is used to adjust settings for maximum efficiency, comfort and control.